And then there’s Kitchensurfing. First launched in New York, the Los Angeles incarnation launched just yesterday. I was provided several, succulent tastes at one Southern media dinner held in Venice last month, just so I could envision how it might play out were I to host something similar at my own place. And the answer is, “cake.” Easy as cake. Or dinner before cake, that is. Co-founded by Ben Leventhal (who also co-founded Eater), Kitchensurfing is the answer to all that ails the food preparation portion of entertaining. You add the setting, people and occasion (which can be as basic as mealtime nourishment), and you’ve got a personalized meal ready to go for all involved. You specify the date, number of people, maximum budget you’d be willing to pay, region or type of cuisine and even the style ranging from cocktails and h’ors doeurves to buffet, family style to plated, and more. If you’re kind of slim on budget, you can also ask chefs to “make me an offer,” allowing chefs to bid on you. Anyway, I can’t wait to have my first dinner party to break in my new place. If you’ve got the funds but lack the kitchen knowhow, you can still look like you’re an entertaining pro. 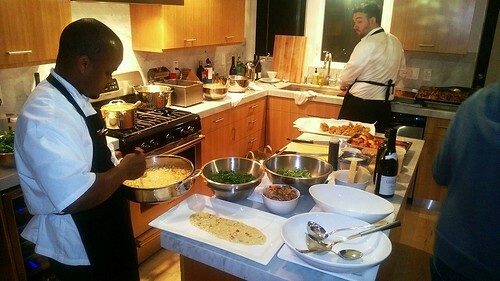 Who knew booking a private chef was just one website away? This entry was posted in Brunch, Food, L.A., wine and tagged chefs, Dinner, dinner party, home, kitchensurfing, L.A., los angeles, parties, private chef, Ryan Rondeno, service, Vartan Abgaryan, website. Bookmark the permalink.